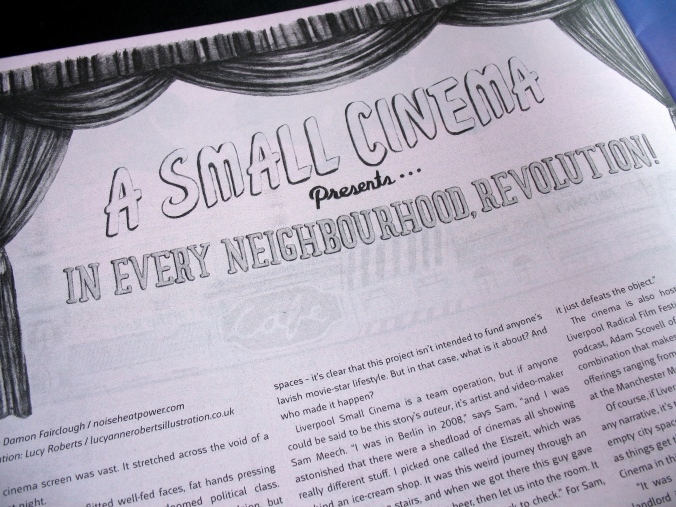 Tucked away in a ground-floor corner of an old magistrates’ court building, the Liverpool Small Cinema does what it says on the film canister: it’s in Liverpool, it’s small, and it’s a cinema. Run by volunteers, it’s also one of the most endearing cultural spaces in the city, as I found out when I wrote about it for Bido Lito magazine. The cinema screen was vast. It stretched across the void of a decadent night. Over its silvery skin flitted well-fed faces, fat hands pressing flesh, the glint and menace of a doomed political class. Instinctively my stomach began to churn with revulsion, but before I could quite take in what was happening there was a flash in the corner of my gaze. Out of nowhere, there were youths armed with petrol bombs; they darted from the darkness and hurled bottles at the images, at the screen. There was panic and confusion as more figures spirited into view. Again they lobbed their blazing projectiles; it was clear that the venue was under attack. The giant cinema was on fire. Its shadows were being consumed by the flames. No need to call Merseyside Fire & Rescue though, as this was a scene from a film rather than just another night at the Odeon IMAX. It was a fragment from Mikhail Kalatozov’s poetic 1964 epic I Am Cuba (Soy Cuba) in which revolutionary students from Havana University were striking against a propagandist news reel; their targets were the lies of the dying Batista regime, but viewed from the plush velvet cuddle of a seat in the Liverpool Small Cinema, the action carried a symbolism that seemed closer to home. “Death to cinema’s super-size culture!” it seemed to scream, meaning a culture bloated by buckets of Coke and pick ‘n’ mix grab bags and popcorn dispensed by the yard. Perhaps it was also meant to herald the dawn of a cinema experience more bijou, less boorish – more akin, maybe, to the memory of cinema as a place of sorcery, not surround sound. The Liverpool Small Cinema is on Victoria Street in the old Magistrates’ Court. Behind its arched gothic door lies a world of endearing shabbiness, of daubed emulsion, of ushers who also programme the films and who probably even built the place too. It feels part art project, part community good deed – like a church hall film-show run by Andy Warhol’s Factory. The venue has been open for little over a month but it’s already building a word-of-mouth following of people who enjoy its films and affordability – the sold-out screening of I Am Cuba cost a mere £3 per ticket. With just 56 seats – plus a couple of wheelchair spaces – it’s clear that this project isn’t intended to fund anyone’s lavish movie star lifestyle. But in that case, what is it about? And who made it happen? Liverpool Small Cinema is a team operation, but if anyone could be said to be this story’s auteur, it’s artist and video maker Sam Meech. For Sam, it was a revelation. Imagining is one thing; making it happen is quite another. But after experimenting with screenings in one-off locations, Sam got the chance to set up a more permanent venue in Moston, north Manchester. Sam’s fascination seems to be for cinema that grows through the cracks in film culture. With promoters such as Elsewhere Cinema and Think Cinema already holding screenings in spaces like Frederik’s and Maguire’s Pizza Bar, it was clear that the city was rich with energetic film experts who wanted to share their passion. The range of programmers involved in the Liverpool Small Cinema is one of the things that makes its future potentially so exciting. Jo Mohammed from Elsewhere Cinema – who presented I Am Cuba – really appreciates its emergence in the city. The cinema is also hosting events by Think Cinema, the Liverpool Radical Film Festival, Chris Brown of the Video Nasties podcast, Adam Scovell of Celluloid Wicker Man, and more. It’s a combination that makes for exciting times ahead, with imminent offerings ranging from Antonioni’s Red Desert to The Living Dead at Manchester Morgue (no Old Trafford jokes, please). Of course, if Liverpool’s grassroots cultural scene is familiar with any narrative, it’s the one in which an exciting project animates an empty city space, only for the hand of commerce to crush it just as things get thrilling. What are the prospects for Liverpool Small Cinema in this regard? It’s early days for Liverpool Small Cinema, but if my first experience is anything to go by, its future is more An Awfully Big Adventure than Gone with the Wind. With the spectacular I Am Cuba still reverberating in my mind and my conversation with Sam having finished, I walked out into the Victoria Street gloom leaving him to lock up for the night. I thought again about those angry students I’d seen in the movie, and how the pictures on that giant screen had been an obstacle to the Cuban people’s date with destiny. By the end of the film they had triumphed – and now here was Sam Meech wielding not Molotov cocktails, but the keys to a picturehouse made of love. In fact maybe they weren’t even keys, but rather revolutionary weapons in a quiet struggle over cinema’s soul. Liverpool Small Cinema was at 57-59 Victoria Street, Liverpool. Since this article was published in summer 2015, the venue has closed. Fortunately, many of those mentioned are still active in the city. This piece originally appeared in Bido Lito, the Liverpool music magazine.